Landscape of small and irregular fields and clustered small farms on isolated area of better-drained land at the confluence of the Clywedog and Clwyd. The earliest evidence of activity in the character area is indicated by a Bronze Age double cropmark ring-ditch to the north-west of the church, in an area of former medieval open field. A cropmark enclosure of possible Iron Age or Roman date is known in the field to the west of the church. It forms the northern tip of the ancient ecclesiastical parish of Llanynys which extends southwards towards Ruthun, and fell administratively within the commote of Colion in the ancient cantref of Dyffryn Clwyd, later to form part of the lordship of Ruthin. The settlement is first noted in the 9th-century Welsh poem Canu Llywarch Hen as 'Llanfawr beyond Bannawg, where the Clwyd joins the Clywedog'. Relatively small character area about 2.1km long and up to 0.8km across, occupying a slightly elevated, saddle-shaped area of ground with a slightly waterlogged area between, about 34-44m above OD. Its siting, in the angle between the Afon Clywedog and Afon Clwyd is the probable explanation of the name Llanynys (island church), a feature which would probably have been more marked before the drainage of the surrounding lands. This was noted by Leland who said 'it is caull'd Llaneinys by cause the Chirch is set betwixt the Ryvers of Cluid and Cluedog, as in an Isle'. There is no evidence of a medieval nucleated settlement around the church, only two houses being noted in its vicinity towards the end of the 17th century. The present small cluster around the church comprises the 18th/19th-century stone inn and stone cottages, the early 19th-century brick vicarage with slated roof, and 20th-century bungalows and small estate of council houses. With the exception of the larger farm of Plâs Llanynys to the south most of the farms are relatively small and clustered together on this isolated area of slightly elevated, slightly better-drained ground. The earliest local building materials are indicated by the church, which was once whitewashed, indicating the use of limestone and some red sandstone, and timber in the case of the porch. The former use of rounded ?glacial boulders is also evident from the churchyard wall. The earliest surviving domestic building is Pwll-y-chwiaid-bâch, a box-framed medieval hall house converted to a storeyed house in the 18th century. Other early farmhouses are of stone, partly rendered as in the case of Drefechan (Trefechan), the late 18th/early 19th-century farmhouses at Pwll-y-chwaiad-mawr, Wern-deg, and Plâs Llanynys are of rendered stone and slated roofs, with brick and limestone outbuildings and a stone-walled yard in the case of Plâs Llanynys, with earlier and later 19th-century brick farmhouses at Ty-côch and Pen-y-bryn with some older stone outbuildings. Medium to small-sized irregular and rectangular fields defined by robust, mature hedges of holly, hazel and hawthorn, with scattered taller ash, willow and alder. The area is signficant in terms of the history of medieval agricultural landholdings in the region. 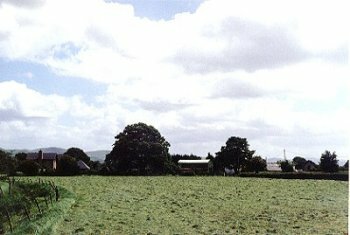 Parts of two medieval arable open field, known as Maes isa and Maes ucha, continued to be worked as separate quillets in an area to the north-west of the church until as late as 1971 when they were finally consolidated into a single holding, some of which are still faintly visible. The distribution of present farms can be seen to partly sited on the outer edges of these arable sharelands, and reflects the settlement pattern in the later medieval period. The medieval parish church at Llanynys, dedicated to the bishop-saint Saeran and first recorded in 1254, lies on the site of a clas or Welsh monastic community in perhaps the 6th century, is one of the important early churches in the cantref of Dyffryn Clwyd. It appears that the church may once have occupied a much larger circular enclosure represented by surviving property boundaries.